Lamson has formulated oil based and synthetic oil free lubricants providing indoor rust protection for parts. **Due to hazardous material handling, Lamson Oils can only be shipped with Ground Service. All FormAll & LamSyn oils (all water soluble & synthetic products) must sit overnight and be tested the following morning.Typical lead time for shipping is 2-4 days after receipt of order. 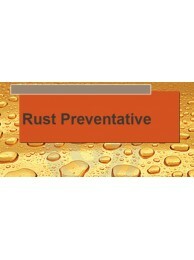 RP-7230 is an oil based, water displacing rust inhibitor that when applied leaves a thin, oily coati..